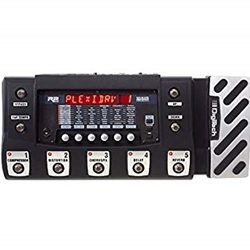 The RP500 takes the complexity of an effect switching system and combines it with the simplicity of stompboxes. Full arsenals of tones are at your disposal, all easily controlled. If you're a player who takes command of their tone by turning individual pedals on and off, enable the Pedalboard Mode button and instantly use the undefined footswitches to turn the RP500's stompboxes and effects on and off within a program. If you are tired with the effect tap-dance and want to concentrate on playing, the RP500's Preset Mode gives you instant access to 5 totally different sounds with the single press of a footswitch (100 presets total across 20 different banks). Now the RP500 features a 20-second looper. Simply play, loop, change tones then overdub. It's that easy.No matter how you like to control your sound, the RP500 has a solution for you.